Its round two of Project Food Blog---a 'vote you off the island' experience for food bloggers---put on by Foodbuzz. This challenge is to cook from a cuisine outside your comfort zone. Perfect: Challenge 1 I defined myself as 'the Uncomfortable Chef' because jumping out of the nest to fly among new, uncomfortable cuisines, foods, techniques and tastes defines me as a chef. Who can argue with the notion that pushing off from one's culinary comfort zone isn't a good thing? I get to fly? Grow? Discover? Taste brand new bites of 'exquisite'? Become a better chef? Sign me up. While I adore the cozy kitchen nest---in my case Italian food, French food, table-worthy recipes and family favorites---it is venturing out, finding new leaves, twigs, bites/recipes/methods that feeds my craving to be a better chef. And while my nest is small, the world is large and I have a lot to learn. There are more cuisines than there are countries---and every kitchen participates in defining their cultural table. In culinary school I studied world cuisines, American cuisine (so diverse!) and Asian cuisine (far out of my comfort zone; but if I can do it---so can you). I started thumbing through some of those cookbooks and was circling curries (from India? from Thailand? green or red?) while simultaneously unpacking another box of cookbooks (just moved home from Italy), when I landed on one called Mod Mex. The Mexican food I put on our home table is paltry at best. A few little tacos gathering on a plate, enchiladas all gussied up, fajitas with homemade salsa and guacamole. Not terribly adventuresome---and not giving proper kudos to a cuisine bursting with all sorts of spicy chilies and peppers, cool citrus, masa, crema, paella, soul-stirring mole sauces and long-roasted, fork-pulled pork. Add in cinnamon and bananas, churros, squash, sopas, beans, empanadas, jicama, all manner of seafood and cilantro. What I love about delving into a new cuisine is wrapping my mind their go-to spices and herbs, and the fruits, vegetables and proteins that define their cultural table. Mexican cuisine is a beautiful cuisine. And with this post, and recipe: my little culinary bird is spreading her wings. Ancho-Seared Swordfishwith ginger-sweet potato mash, seared escarole, and mango mojo de ajo serves 6. 1. Make ginger-sweet potato mash: wrap sweet potatoes in foil, bake in 350 oven for 1 hour. Unwrap, peel off skins, then mash potatoes and place in pot with remaining ingredients. Heat to low, leave on lid to keep warm. for swordfish: combine chili powder/sugar/salt/pepper in flat bowl for dredging. Put pan-for-sauteing on stove. Get out your canola. for escarole: wash, spin and chop. Get out butter, KS&CP. for mango mojo: prepare peppers, garlic, mango, lime, cilantro and butter (if you slice up cold butter---it has more surface area and softens quickly). Have at hand: canola, stock, salt. Put second pan-for-sauteing on stove. 3. Make mango sauce: Skillet on medium-high, add oil, and saute garlic and chilies 1-2 minutes. Add mango and stock, cook to reduce liquid by half. Add lime, and whisk in butter one cube at a time to incorporate. Stir in cilantro, season with salt. Keep warm. 5. Make escarole: in same swordfish skillet (wipe out as needed), heat to high, add butter then escarole, stir and wilt about 2-3 minutes. Remove from heat; season with KS&CP. 6. Plating: (this is up to you; I plated it two different ways) place pile of sweet potatoes, top with escarole, top that with swordfish and finish with the mango sauce. (note: when I removed the swordfish from the oven, all this yummy juice had accumulated---USE IT. This is the good stuff. I stirred it into the sweet potatoes. You could also pour it over the swordfish or on top of the escarole...). adapted from Dos Caminos Mexican Kitchen MOD MEX. this challenge was my excuse to learn a little more about chilies and peppers. did you know? 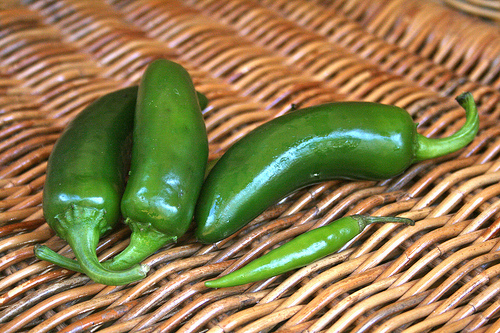 fresh chilies have one name---their dried counter-parts have a different name. I blog about recipes that are worth your time; if it isn't fantastic---I don't blog about it. we only have so many bites in this life... my goal is to make each one count. even in other cuisines: my goal is food/recipes that are accessible, approachable and adaptable to your home kitchen.